Do come down to Yio Chu Kang Stadium this weekend to catch an exciting weekend of Rugby 7s! With the nation’s best pledging their loyalties to different clubs, there will definitely be many exciting moments to behold. Spearheading the campaign will be defending champions SCC, looking to field a team to win their 3rd Series in a row! 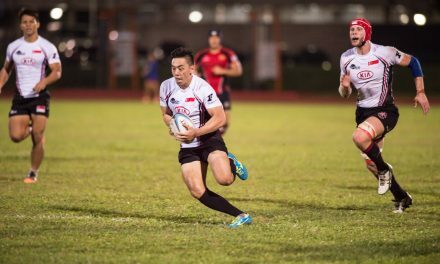 It is to be expected that speedster Bryan Ng will look to use his vast international experience in order to capitalise on the one-man wrecking crew. As intimidating as the current champs can look, surely the Saint Andrew’s team will be equally impressive. Boasting a roster filled with international 7s caps, this might just be the team to look out for this weekend. Teng Chong Yao, Jay Hykel and Sidney Kumar will each bring invaluable firepower and know-how from the international circuit to the table. Saints will definitely want to lead the race to pole position and better last year’s haul of second. Coming in third last year, the Bedok Kings will look to climb up against the order of rankings. 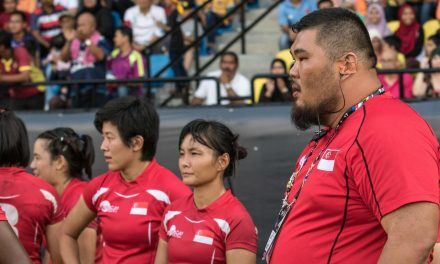 Under the leadership of Farhan Amran, the Kings have the requisite expertise in the ranks with national 7s player Azmi Suliman and the talented duo of Low Feng Hua and Jamil Alvaro. This is not to say that the top three seeds will be the only ones bringing exciting play to the tournament. Other teams such as Blacks RFC will showcase players such as Ngen Ge Liang and Nazryn, while the Combined University Team will be packed with unbridled potential in the likes of Keith Arriola, Gideon Chan and James Morgan. A pulsating weekend awaits all spectators! On the other hand, the women’s rugby fraternity are also gearing up for a weekend of Rugby 7s action. Last year’s champions Skyllas will be sending in 4 teams- Skyllas Wind, Water, Earth and Fire to defend their crown! Runner ups Blacks are not fazed by the challenge and are sending in Blacks Thunder and Lighting to strike their way to the top. The dark horses Bucks should never be underestimated and tertiary teams NUS and NTU will be eager to pit their skills against the established women’s clubs in the country. Have a good rest tonight and see you at the SRU Club Sevens Series this weekend!